President Maithripala Sirisena presided at a ceremony to present the Akthapathraya (Act of Appointment) to Most. Ven.Ambagaswawa Rahulabhidhana Thera on being conferred with the title of ‘Sadhdharma Keerthi Sri Chandra Jothi’ and the Deputy ‘Sanghanayake’ of the Matale Maha Disawa. The ceremony was held at the Dambulla Sri Walagamba temple yesterday. The President also presented the ‘Vijinipatha’ to the Thera. 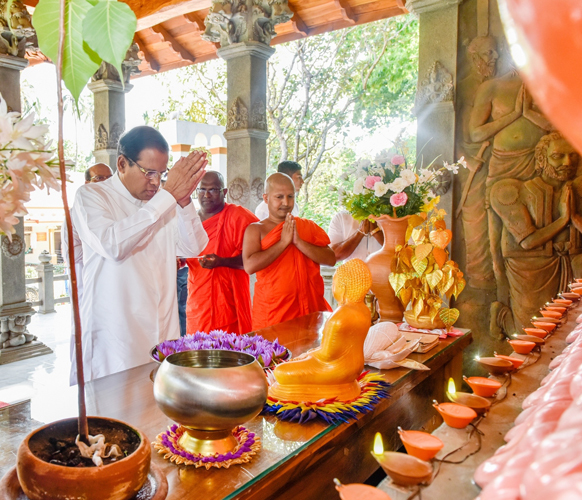 President Sirisena also unveiled the commemorative plaque to mark the completion of the reconstructed lake near the temple and also inspected the vegetable garden at the cultural village organised in the temple complex.